Not all people are adversely affected by mould however those that are may experience asthma, tiredness, rashes, headaches and migraines. Toxic moulds produce mycotoxins that can pose serious health risks. Prolonged exposure may be particularly harmful. Our flexible approach means we can design a tailored program for your workplace. Our intensive programs include an initial consultation and mould assessment that offer hassle-free, long-term solutions. Do you think you may have mould in your workplace? 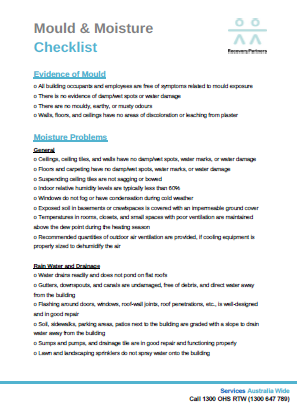 Download our free mould and moisture checklist.